n 1976, I acquired my first professional quality camera. The following year I lived next to the Metolius River in Camp Sherman, and worked as a carpenter at Black Butte Ranch. During my time at Black Butte I really began exploring my creative process in earnest. Flash forward 30 years. The year 2007 provided the most beautiful fall colors I have ever experienced in Central Oregon. 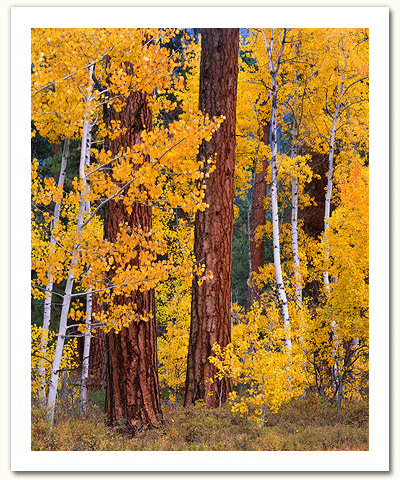 It was during this time I discovered the scene you see here in 'Speaking Fluent Aspen II.' It was a two day process. The first day consisted of brilliant sunny skies, hours of scouting, and culminated in several photographs taken just after sunset. I use 4”x5” large format film, so the results of my efforts remained unknown in the latent images in my film holders. I was not satisfied. The next day I awoke early to overcast skies. Now that's more like it! Driving toward Black Butte, I could not conceal my excitement, or my fears. Would the overcast hold? Would the wind be blowing? When I arrived, my heart rate quickened as I discovered the answers to those questions. I was greeted by fabulous light, and no wind. Soon I was zeroing in on my compositions, having paid my dues the day before. I began with a horizontal view. As I completed that composition in perfect conditions, I focused on the vertical. Get closer, my instincts kept telling me. As I moved in, tunnel vision took over. The magic moment was at hand as I aligned with the unique rhythm of Black Butte. At that moment, my vision shone as 30 years of experience coalesced into... 'Speaking Fluent Aspen. '.